The 19th annual R. Bryan Miller Symposium features top speakers from industry and academia who will share cutting-edge research at the interface of chemistry, biology and medicine. 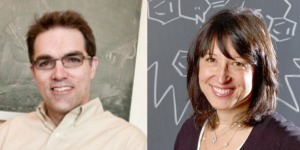 Plenary speakers include Justin Du Bois (pictured, left) of Stanford University and Alanna Schepartz (pictured, right) of Yale University. A full list of presenters and the symposium agenda are available online. The Miller Symposium celebrates the contributions of Professor R. Bryan Miller in organic chemistry that laid the foundation for thriving programs in pharmaceutical chemistry and chemical biology at UC Davis.